Suffolk County Police Marine Bureau officers rescued three people from the water after they jumped off their boat that caught fire in the Great South Bay tonight. Suffolk County, NY - June 6, 2015 - Suffolk County Police Marine Bureau officers rescued three people from the water after they jumped off their boat that caught fire in the Great South Bay tonight. Matthew Biagi was operating a 2001 25 foot Chris Craft with two passengers on a trip from Oakdale to Fire Island when they noticed smoke coming from their engine compartment. They attempted to put out the flames with a fire extinguisher but the extinguisher did not work. The three men put on personal flotation devices, jumped overboard and called 911 from a cell phone at approximately 6:55 p.m. The water was approximately 60 degrees. Suffolk County Police immediately notified the US Coast Guard and Fire Rescue and Emergency Services. Suffolk County Police Marine Bureau officers Robert Femia and Daniel Smith, on patrol vessel Marine Kilo, responded to the location and pulled the men from the water at approximately 7:15 p.m. The officers then administered first aid for treatment of hypothermia. Marine Mike, Marine Juliet, and Marine 35 also responded. Biagi, 41, of Forest Hills, his brother Joseph Biagi, 40, of Weehawken New Jersey and Richard Damaro, 42, of Forest Hills, were transported by Marine Kilo to Suffolk County Police Marine Bureau Headquarters at Timber Point in Great River, where they were checked by emergency medical personnel from Islip Exchange Ambulance. The three men refused further medical treatment. The fire was extinguished by fire boats from the Blue Point and Bayport Fire Departments. The vessel was transported to Timber Point for examination by the Arson Squad. 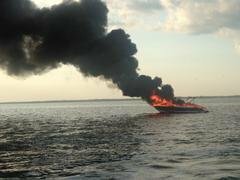 Subject: LongIsland.com - Your Name sent you Article details of "Three People Rescued from Water after Boat Catches Fire"